Residents of southern Worcester County communities (and beyond) are invited to attend the Feb. 19, 2019, Nichols College Career and Internship Fair. The event, which will feature recruiters from over 70 employers, will be held from 2 to 4:30 p.m. in the College’s Athletic Center (in Chalmers Field House) on Center Road. Professional dress and resumes are required. 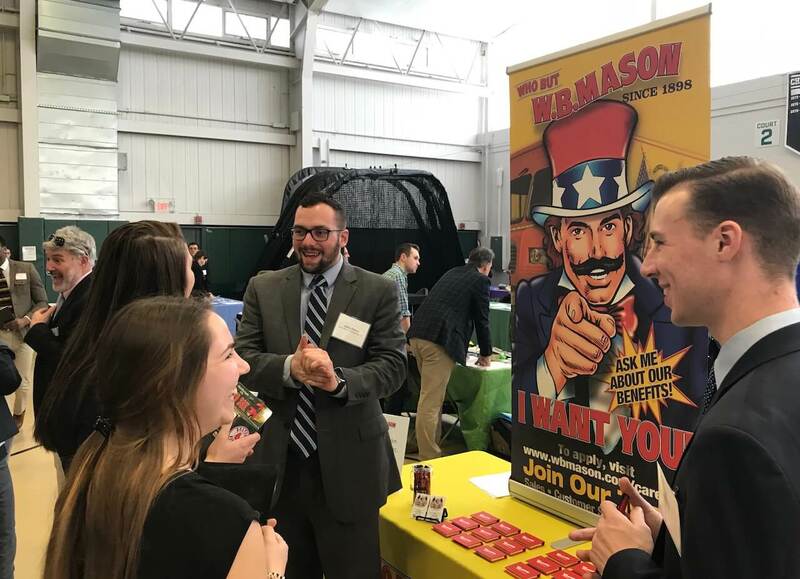 The annual fair offers a convenient opportunity for Nichols College students and local residents to network with employers and learn what it would be like to work for their companies. Some of the registered employers include Worcester Bravehearts, The Kraft Group, TJX Companies, Mohegan Sun Casino Resort, Okemo Mountain Resort, U.S. Drug Enforcement Administration, U.S. Secret Service, Massachusetts Treasury Department, City Year, New Hampshire State Police, GEICO, Newport Hotel Group, Northwestern Mutual Financial Network, Walgreens, Scotts Miracle-Gro Co., Sherwin-Williams Co., Open Sky Community Services, and AAA Northeast, among many others. Recruiters at last year’s fair were impressed with the fair—and particularly with how polished and professional Nichols College students are. “Excellent quality candidates,” said Mackenzie Walsh of Robert Half Accountemps. “Love this Nichols event! The students are very professional and prepared. We are always impressed with this event. It’s well organized and thoroughly enjoyable,” said a recruiter from Chicago-based Waterton Hospitality. For students needing a professional outfit for the fair, they can take advantage of the Nichols Bison Boutique in Fels Student Center. For more information, contact the Nichols College Career and Professional Development Center at 508-213-2489 or cpdc@nichols.edu. Academic Affairs, Career Development, Community, Events, Newsroom, Students career development, career fair, careers, companies, employment, internships, jobs, recruiters. permalink.